Unusual roles come naturally to Charles G. Irvin, PhD, director of the Vermont Lung Center at the University of Vermont. 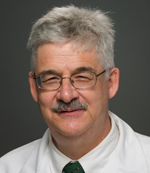 When the scientist-revered for his work in pulmonary physiology and asthma pathogenesis-was asked to step in as interim chief of the Division of Pulmonary and Critical Care Medicine at Fletcher Allen Health Care, in Burlington, Vt., he simply accepted. That’s because Dr. Irvin isn’t your average PhD. At the university, Dr. Irvin is also professor of medicine and molecular physiology and biophysics, vice chairman of research affairs for the Department of Medicine, and assistant dean for faculty for the College of Medicine. As the principal investigator of the American Lung Association Asthma Clinical Research Center Award to Vermont, he is deeply engaged in clinical trials and was the lead investigator on the Effectiveness of Low Dose Theophylline as Add-on Treatment in Asthma (LODO) trial. An ATS member since 1974, he’s served as chair of the Assembly on Respiratory Structure and Function and on the Board of Directors as well as the editorial boards of the American Journal of Respiratory Cell and Molecular Biology and American Journal of Respiratory and Critical Care Medicine, among many other ATS posts. His research has been highly collaborative-and highly diverse. He’s focused on basic studies, animal models, and clinical trials. He’s become an authority on animal models of asthma pathogenesis. For years, Dr. Irvin has helped Dr. Lee and others interpret lung-function tests in animal models. Dr. Lee’s lab studies eosinophils, the pro-inflammatory cell infiltrates that go into the lungs of asthmatics and COPD patients, by genetically engineering mice to replicate patient conditions. “With Charlie’s help we can ask questions about lung function and how efficient the lungs are operating and what are the consequences of all the tinkering that we’re doing,” Dr. Lee says. At the University of Vermont, Dr. Irvin has been collaborating with Yvonne Janssen-Heininger, PhD, to study how the epithelium orchestrates the response to inhaled allergen and other insults in the lung, and examine Nuclear Factor kappa B (NF-kB) captivation in the epithelia. To know Dr. Irvin is to know his mentors. Dr. Irvin earned his PhD in physiology in 1978 under Jerome “Jerry” A. Dempsey, PhD, who researches the regulation of breathing in various physiologic states in un-anesthetized humans and animals at the John Rankin Laboratory of Pulmonary Medicine. Dr. Irvin then earned an NIH–NRSA grant to take his post doctoral fellow under the late Peter T. Macklem, MD, at Meakins-Christie Laboratory at McGill. Dr. Macklem’s work constitutes the scientific basis for the ongoing campaign against smoking. Recruited by Reuben M. Cherniack, MD, Dr. Irvin was hired in 1980 as assistant professor at the University of Colorado Health Sciences Center in Denver and as the associate director of the Pulmonary Physiology Unit at the National Jewish Center for Immunology and Respiratory Medicine. In 1998, he seized the opportunity to move to Vermont. “The Vermont Lung Center was a bit dormant,” Dr. Janssen-Heininger says. “Some of our previous leadership had moved on. Though the research community was active, it had lost some its vibrancy. Dr. Irvin, who’s secured millions in research funding during his career, wrote the National Center for Research Resources Center of Biomedical Research Excellence grant, one of only two NIH COBRE grants on Lung Disease. “As a result, the Vermont Lung Center was reborn,” Dr. Janssen-Heininger says.